1803 had its fair share of usual upgrade problems and so does 1809 (driver-related, failed upgrades and error codes), but the numerous reports of permanent data loss during the upgrade to 1809 are very alarming. This has to be the most serious issue with upgrades in the history of Windows 10. Edit: There is also a report about 1809 breaking “run as administrator” from the context menu. You would have thought the Insiders would’ve been able to– oh, right, they were told never to use “normal” machines to test. Is this evidence enough that this method of testing software does NOT work? Why isn’t Microsoft listening? another report blaming UX Patcher. I’ve had this before and I’ve had to revert to the previous build, uninstall the UX patcher, then upgrade and reinstall the patcher. That’s not a problem to me, (I mod system files I cause instability, I accept that) but Windows 10 is meant to remove “Incompatible Software” for exactly this sort of reason. Yet in my experience it’s failed to remove an actual incompatible program twice, but has managed to remove my CPU temperature monitor. This kind of updating experience is to be expected for the victims, er, unpaid beta testers, er, users of Windows 10. As far as MS is concerned, that’s why they are there! It is one thing to knowingly beta test; it is quite another to be unknowingly volunteered to beta test. Especially when that particular button (the only button they provide), says Check for Updates, not Check for Updates and Install Them If Found. Back in the old days (pre-GWX and Rollups), if I had a critical project or PC use scenariio, I would always check for updates before I started to avoid it doing an update on its own and nagging for a reboot. Of course THEN, updates had never broken my machines and were not gigabytes in size. The above was mine. I should have noted that TrustedInstaller owns those registry keys so that their manual removal requires “take ownership” by the admin-level regedit user. I should also note from my own personal experience that their removal has no consequence other than eliminating the annoying and superfluous event notifications for the TDL service that no longer exists in W10.1809. Removing those registry keys just hides the warnings, but does not resolve the underlying problem. So, don’t remove those keys and let the ‘experts’ at Microsoft get their mess cleaned up. The installer uninstalls CCleaner — which may be a bug or a feature, your choice. Yep. IMHO, MS is doing folks a favor, but that’s just my curmudgeonly side speaking. How else are we supposed to remove the bloat files left behind by internet browsers and other programs? Nope, for me BleachBit is not selective enough about cookies. b, I believe you meant “Windows 10 v1809 is incompatible with CCleaner…” and not the other way around. Woody’s right, though – it’s a program that is not of much benefit, in my opinion also. I have ccleaner 5.30 on one machine and 5.46 on another. Both of these survived the “upgrade” to 1809. You may want to go back to an older version since Avast can’t stop messing ccleaner up. Version 5.30 won’t force an upgrade like 5.46 will, even when it’s unchecked. On the “What needs your attention notification”, select the back button to remain on your current version of Windows 10. A fix for these issues is already included in Intel® Display Audio Driver version 10.25.0.10, which is bundled with Intel® Graphics Driver version 24.20.100.6286 and newer. Intel shouldn’t be having to come out with a suite of new drivers every 6 months. It’s not always all about Microsoft. It’s one thing to come out with new software to add features or fix one’s own bugs. It’s another to have to fix incompatibilities introduced by a new OS release. Even plankton can sense that 6 months is (at least) 6 times shorter than it should be for an OS release cycle. Loss of data, eh? Just as I was beginning to think Microsoft was making somewhat of an effort to correct the Windows Update situation they set a new low and blow away that ridiculous notion. I’m not even going to bother testing this one and skip this release entirely. Declining in WSUS. But the lesson is, that you don’t click on anything, before you’ve updated your system and data backups. Backups has alwas been important. Nowadays they are highly critical. In today’s tech world and the people who run it, the mind set is and looks like will always be, if it works and it’s working well, let’s fix it. This is brought to light in the never ending updates. Every time I turn on the PC, something is being updated. I really do miss the Windows 95, 98, and XP days when you were in control instead of this never ending update train that every body is on. I understand security and the crooks being high tech and all, but this has become an absolutely crazy nightmare. I really feel for the average non computer savvy people out there, as Windows has become a real life nightmare for them. If you lost all of your \Documents, \Pictures, \Music or \Videos, there’s a fix. Use Recuva. Even though the folders are still there, and they’re empty, the missing files were deleted, not otherwise erased. Recuva can recover them. A nice tip. But unfortunately Recuva only works on a Hard Disk Drive not on a SSD. A Hard Disk Drive only erases the first letter of a file and if the blocks of data are not overwritten then this can be restored by Recuva. A SSD stores file data blocks everywhere in the flash memory there is no structure so nothing can be restored. Having important files on a HDD Hard Drive can help out if anything bad happens but should never be taken for granted as even a single overwritten data block can corrupt the recovery. Always make regular backups even more so when doing something that involves major change. I’d be interested in hearing from anybody who can’t recover their 1809-blasted files from an SSD with Recuva. If you’re in that category, could you give iCare Data Recovery Free a try? EaseUS also claims to do free recovery of deleted files on SSD. I haven’t tested it, but it’s worth a try. Makes me wonder if MS will ever be able to bring those zapped PCs back to life. I tested both your suggestions. I am on a Windows 7 64bit PC though. Icare Recovery found no files to restore. So that was not much help. Easeus SSD-drive-recovery found even more files than Recuva but all files that were restored also had unusable file headers and could not be opened or used. On the Easeus website they warn that if the SSD has Trim enabled then the tool can not restore files at this time. It also has a 500 MB limit of files you can restore freely after that you need to upgrade to the payed version. So that is three tools that can not retrieve a working file copy from a SSD. I have no idea if there’s a difference between Win7 and Win10 – although I suspect the use of TRIM instructions by the OS may have an effect. TRIM is almost definitely the explanation here. When the files are deleted, the TRIM commands are sent to the SSD controller to erase the blocks. Not necessarily right away, but it will happen. Recovering deleted files from SSDs with TRIM enabled can be an impossible task. Susan Bradley just added details about a bug with Win10 1809 and Outlook 2010. The bug knocks out an email platform called Icewarp. Rolling back to the previous version of Windows 10 resolves the error. We have received multiple emails from users reporting Edge’s issues. The browser seems to be completely unusable after the update is installed, with multiple users reporting the same issue. Microsoft Edge stopped working for me after 1809 upgrade. Enabling IPv6 allowed Edge to work – but I’m not comfortable with IPv6. Firefox is my new default browser. If you are not using Edge, it probably doesn’t need to work. Probably better if it doesn’t. It appears no Microsoft prior testing was performed. See, that’s the punch line. Millions – yes, millions – of people tested Win10 1809 before it was released. They just didn’t test the right stuff. I have no problem with Microsoft sending out Insider builds (we used to call ’em “marketing betas”). But it’s demonstrably a very poor way to test things. From other subsequent information on this site, it appears this problem was reported by users, but not addressed by Microsoft. Does Microsoft test in-house prior to any releases? Windows automatic update failed to upgrade my system to Version 1809 despite my system being fully up to date immediately before starting the update, including drivers. I have also created an installation USB flash drive using the MCT. Using this in an attempt to upgrade also failed. In both cases, the system rolled back to the pre-update state. What are the specs on your hard drive? How much used? how much free? How old? What version of Win10 are you upgrading from? With an upgrade the installer makes a copy of your HDD to a C:\Windows.old folder which can be quite large. There is also the installer that takes up a lot of room. This is 2018, right? How is it that with gigabytes of installation materials the key part of that message is encoded in a couple of hex numbers, and not stated plainly in English? Sure, we understand that Windows has to be translated into languages all over the world, but even an error message in just one language (doesn’t even have to be English) stating precisely what went wrong rather than a hex code no one could possibly interpret would befit a modern operating system, no? that looks very much like the same error message I received when I tried updating my 12 year old HP laptop (which I’ve mentioned many times here already so I won’t go into the details) from 1803 to 1809 with 1809 on a USB stick. Happened right at the very end of the attempted upgrade. I then tried the clean install method which loaded files from the USB stick (or whatever it was doing) while showing me the nice blue Windows logo and that was as far as it went. Stuck with the blue Windows logo for all eternity perhaps? I gave up and switched off after about 10 minutes. So, I’m back to 1803 courtesy of a Macrium image (just to be on the safe side even though it did boot back into 1803 after the failed upgrade/clean install attempts). Interesting situation I now have – a 12 year old laptop which originally came with Windows XP that refuses to die. Runs Windows 7 fine but I can’t update it past December 2017 without it blue screening all the time because the processor doesn’t support SSE2 and Microsoft can’t/won’t fix it. Runs Windows 10 1803 reasonably well (especially considering it only has 2GB RAM) but it looks like I can’t go any further with that now seeing as 1809 doesn’t want to install – either by upgrade or clean install. Now… where did I leave that USB stick with Linux Mint on it? The semiannual downgrade follies strikes again. If the consequences to the victims weren’t so serious this would be a long running farce. Why would anyone think it’s special that user data gets deleted? It’s not about users any more, and it’s certainly no longer about a continuity of user experience. XP was about eXPerience. Old news. Windows 10 is about being surprising and exciting! Not to lessen the gravity of an OS losing people’s data, but who, in 2018, doesn’t think backing up their data is important and necessary? And no, I don’t mean in the cloud. I mean somewhere over which you have control. I agree with you though wholeheartedly. MS sees end users as free beta testers, nothing more. Rest on your laurels will come home to roost. Constant frustration with Windows is corrosive to good will and customer loyalty. Continue the pattern and watch customers leaver; first in small numbers but after awhile the numbers will be noticeable. Inevitable pattern. Well, People must be aware that even if your computer loads the desktop and loads the programs you use its not a guarantee that your computer isn’t having issues. And its not like I want to plant paranoia but maybe that program you installed and haven’t used in a while no longer works. maybe I am stupid using computers and maybe i don’t know how to configure a computer, however as far as I can tell from my windows 10 experience, this have been the only two options lately. Conclusion: even if people are telling you that 1809 isn’t having ay issues, don’t fully trust them. So… even if the deleted user data problem is identified and fixed, how will we go about upgrading? I’m guessing we’ll still have to install the initial 1809 release then apply subsequent patches, but at that point our data is still gone. Of course, backing it up to removable media before upgrading is the obvious solution, but we all know most people don’t do that or even think about doing that, because previous upgrades have gone (mostly) flawlessly. They should be able to patch the upgrade process and fix the data loss issue. Usually, when upgrading through Windows Update, the latest cumulative update is downloaded and installed together with the upgrade, so you end up on the latest build directly. Also, newer installation media that fixes it. I was hoping with less WOW features that 1809 would be a focus on stability and tweaks. But obviously some are seeing some real issues if they are completely losing files. No doubt my systems are locked down for a long while until this stuff get’s exercised. Surely if you have already entrusted Microsoft with your user data on their cloud all is fine. Isn’t this the underlying push? Demonstrating to the reluctant user the value of all Microsoft has to offer, if you just agree to everything in their Utopia. Nothing earth Shattering to report, just the usual Win10 new version niggles, Win10 Home 1809 living in a VHDX clean install. Apps inc UWP and Edge (crashing Apps, opening and closing) needed to have “Take Ownership” of the folder. C:\Program files\WindowsApps (hidden file) and C:\users\YOUR NAME\AppData\Local\Packages (hidden again) fix’s the crashing Edge and UWP Apps. Those normally work on all versions for “Seamless” Networking not this time. It seems the best way to fix it is to uninstall all the Ethernet components and Reboot, then you get Fully functioning Network Discovery on all machines and the errant Win10 1809 Machine for one session only, next Reboot back to nothing again. Easy way to do it is Admin CMD prompt type netcfg -d Then Reboot. If this is going to be a long/short term Problem and you really need Network explorer and its various functions then create a batch file, create an elevated “Shutdown” shortcut to the Batch file created below, and pin to the Desktop or Task Bar. Note Windows Task Scheduler cant run scripts in Shutdown mode only GPOL in Win10 Pro and above alas. Seems to be fixed with the latest update: https://support.microsoft.com/en-ca/help/4464330 So there’s no need for the fancy fix netcfg -d any more, got a similar problem it may well remedy note you need to install SSU https://support.microsoft.com/en-ca/help/4465477 first but all the above services remain as set as I have yet to back them all off and in all likelihood I will probably leave them alone seeing as the thing’s working now. I agonised about installing with all the “fun and Games” and problems around but hey nothing ventured nothing gained. Lets see if this ones a “keeper” of sufficient quality to replace 1709 in December. Anyone else where C:\Program Files\Windows Defender\MSASCuiL.exe (pre-Win10 Defender systray icon proggy) got added to the ‘Run’ key (check Task Manager Startup tab) after upgrade from 1803? No kidding, happened here. No, not under the Task Manager’s startup tab. However, I do see it included in the list for “Select which items appear on the taskbar” under Settings -> Personalizatiom. Enabling/disabling that MSASCuiL.exe item does nothing obvious, but switching the item in that same list for the “Windows Security notification icon” appears to work properly. Thanks for checking. You can reset (clean up) the list by deleting ‘IconStreams’ and ‘PromotedIconCache’ under HKEY_CLASSES_ROOT\Local Settings\Software\Microsoft\Windows\CurrentVersion\TrayNotify and restarting exeplorer.exe via task manager afterwards. I feel sorry for all of you Win10 users. I don’t currently “absolutely need” windows10, so I’m drama-free on a safe, secure, stable “old” Windows 7 Pro* and can keep working 24/7 without any interruptions or glitches whatsoever. * = when “Pro” actually meant something! Meanwhile… at my office we’ve rolled out Apple’s newest macOS Mojave to 20% of our endpoints to evaluate further adoption. Zero issues encountered. And we have a lot of third-party software. No data loss, no scrambled settings, no failed installs, no showstoppers, etc. One of the easiest OS upgrades ever. Computers connected to my local network are no longer visible after completing the Windows 10 1809 upgrade on 10/02/2018. Network discovery is on. Some of my friends have observed this same issue. This problem did not exist under the previous release and I haven’t read any reports regarding this problem. I’ve heard rumblings of connection problems after the 1809 upgrade. Can anybody confirm (and describe)? After the update to 1809 caused all Windows 10 systems to disappear from Networks I checked Function Discovery Provider Host and Function Discovery Resource Publication and both were running. The update to 1809 had changed them to Automatic. I changed them back to Automatic (Delayed) and rebooted but that didn’t make WS-Discovery and Network Discovery work again. The only way I was able to get Network Discovery to work was to reinstall SMB1 instead of only using SMB2 and 3. Microsoft has said running SMB1 is a security risk but they have never fixed WS-Discovery to be compatible with UNIX based versions of mDNS and now this update has completely broken it where it doesn’t work with Windows 10 systems. I could only see Windows 7 systems on the LAN after the update. Fortunately, I reinstalled Windows 7 on my computers about a year ago and installed Linux Mint on them in 2015 so when Windows 10 breaks I can boot into an OS that still works. I volunteer tech support to local rural library. One Win10 PC running Office 2016 updated and now cannot open MS Word documents that came over Internet. Get the usual cryptic MS error message that file is corrupted. If I open file from another networked PC and save it back on source PC, they can open the document without problems. Have to go through my notes. I have seen this before but this old guy can’t remember how he fixed it. Found the problem. Some of the Trust Center settings had been reset. I am missing (Server 2019) the TileDataCache (or similar) folder with the “start menu database”. Does anyone know what happened to it? I used it to copy it into the Default user folder (avoiding configuring the start tiles again and again for every server). Feedback to my #221582 above : After the failed update had automatically rolled me back to the pre-update state, I turned off Windows Update and cleaned my system with cCleaner and Windows Disk Cleanup. I ran chkdsk /r; sfc scannow and DISM. No errors were detected. I made a fresh full image backup of my system (just in case, as always). I turned Windows Update back on again and immediately noticed an update being downloaded. A few moments later I was asked to restart. After a successful re-boot, on impulse, I ran the Update Trouble-shooter and it detected and fixed a “database error”. (Previously running this trouble shooter had revealed no errors). Thereafter, Windows Update started downloading the new version upgrade. Installation proceeded uneventfully (although there was a lengthy “pause” of nearly 20 minutes at the 42% installation stage). All is now fine, and no issues have been detected. Unfortunately, in my eagerness to get the upgrade installed, I failed to note what update/patch had been installed just prior to running the trouble shooter (installation of the upgrade obviously cleared the previous version’s update history). Either way, its seems it put my system in a state that the trouble Shooter could deal with and prepare me for a successful upgrade. Thanks once again to all who commented and/or offered advice. 2 – Continual “Check Firewall” popups for users and admins on domain connected PC with domain firewall OFF. 3 – Rollback to 1803 wiped. No update history retailed or restore points retained. 4 – On uninstall of “Intel Network Connections” from a 2017 install, video drivers then got replaced after reboot. Wondering if anyone else has encountered this issue, although I can’t definitively guarantee that it was caused by the upgrade: I restarted my computer EOD on Friday, when I came in on Monday, I had a blue screen with Automatic Repair couldn’t repair your PC message. I tried rolling back version, restoring from restore point, and start-up repair, with no luck. Chkdsk was clean. Could you please provide up with some information on the specs of your PC. Did it boot up OK after the upgrade initially? That’s the thing – I’m not even sure if the computer had been upgraded before Friday, was upgraded during the restart, or if this is completely unrelated. I’m trying to determine if it happened to others due to the upgrade. Right now, I’m trying to repair from a dvd of the 1803 version. Dell Optiplex 3020, running Windows 10, most likely version 1803. Both installed via Windows Update, along with Adobe Flash update and MSRT: No apparent issues after restart. Consensus at thie point is that the CU fixes the GPO-related disappearing profile problem, but it does NOT fix the deleted Docs, Photos, etc, problem. Which means 1809 shipped with two severe problems, only one of which has been solved. Sure wish MS would talk about it. Or maybe they think that if they ignore it, the problem will go away…. Since updating to 1809, my start menu continually resets back to a default state. Customization is futile! All fixes seem doomed. How long until MS fixes this one??? Beware of 1809 File Explorer archive extractor, there is a risk of data loss! It’s just, I’m trying to figure out if it’ll be better to go to 1803 or 1809 from 1709. I mean, what with having to fix things by hand after the upgrade to 1803 anyway and again to 1809… well, being able to skip one of those would be nice. Can’t properly expect to be able to wait for 1903 to stabilize, after all. Out of seven issues, table shows three Resolved, four still blocked. That table doesn’t include issues fixed by previous cumulative updates such as deleted files, missing profile, default apps, zip copy, task manager CPU%, mapped drives, 50% brightness, WMP seek bar etc. 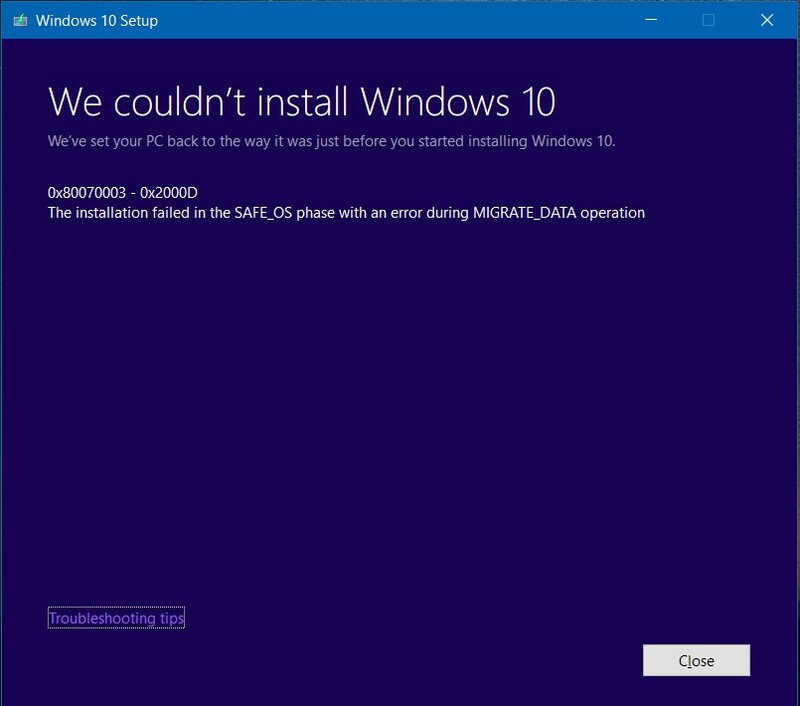 I guess there probably isn’t a simple way to rebuild the .iso by ourselves with a later cumulative (what with the installer itself needing to be fixed for some of these), so that’d mean waiting for Microsoft to get around to it, hopefully…?